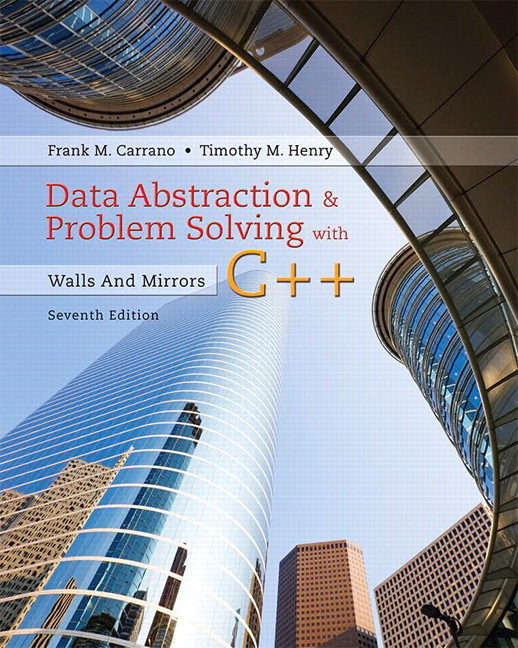 Data Abstraction & Problem Solving with C++: Walls and Mirrors, 7th Edition is the recipient of a "2018 McGuffey Longevity Award (College)" by the Textbook & Academic Authors Association (TAA) ​for​​ ​textbooks and learning materials whose excellence has been demonstrated over time. 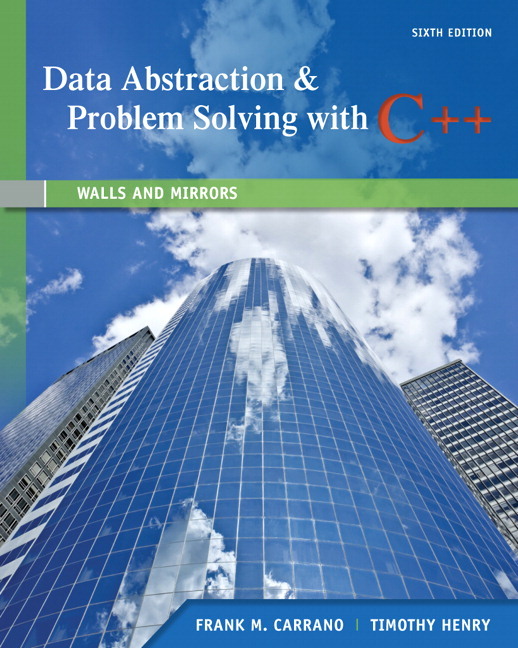 The Seventh Edition of Data Abstraction & Problem Solving with C++: Walls and Mirrors introduces fundamental computer science concepts related to the study of data structures. The text explores problem solving and the efficient access and manipulation of data and is intended for students who already have a basic understanding of programming, preferably in C++. The “walls and mirrors” mentioned in the title represent problem-solving techniques that appear throughout the text. Data abstraction hides the details of a module from the rest of the program, whereas recursion is a repetitive technique that solves a problem by solving smaller versions of the same problems, much as images in facing mirrors grow smaller with each reflection. Along with general changes to improve clarity and correctness, this Seventh Edition features new notes, programming tips, examples, and programming problems, as well as C++11 and C++14 features–including safe memory management using smart pointers–and safe and secure coding techniques. Exceptions are used rather than return values to signal unusual situations. Safe and secure coding techniques are used, such as those found in SEI CERT Coding Standards. C++11 and C++14 features are used where applicable. REVISED! Revised figures improve overall clarity. NEW! Technologically dated examples have been replaced with newer examples. NEW! Notes and Programming Tips have been added throughout the text. NEW! Programming problems in the areas of gaming, finance, and e-commerce have been added. NEW! Security Notes represent a new element in the text. NEW! A new C++ Interlude, "Safe Memory Management Using Smart Pointers,” introduces smart pointers, a C++11 feature. Chapters subsequent to this interlude use smart pointers. UPDATED! Multicultural names are used when naming people in examples. The distinction between specification and implementation is emphasized. Extensive coverage of object-oriented programming techniques is featured. Core data structures are featured, rather than non-essential C++ language syntax. The role of classes and ADTs in the problem-solving process is illustrated. Linked data coverage is made accessible through progressive discussion as the text introduces the ADTs bag, stack, and list. “Walls and mirrors” represent problem-solving techniques related to data abstraction (walls) and recursion (mirrors), explored throughout the text. C++ Interludes cover relevant C++ topics as needed between chapters. Use of the Standard Template Library (STL) with examples is included in most chapters. An appendix, "Basic C++ Syntax,” is included for students who are making the transition from another language, such as Java or Python. Technologically dated examples have been replaced with newer examples. Notes and Programming Tips have been added throughout the text. Programming problems in the areas of gaming, finance, and e-commerce have been added. Security Notes represent a new element in the text. A new C++ Interlude, "Safe Memory Management Using Smart Pointers,” introduces smart pointers, a C++11 feature. Chapters subsequent to this interlude use smart pointers.